The is the English Revised Version amended by placing the American Committee's preferences directly into the text. In addition, Williams made others changes including using "immerse" for "baptize." 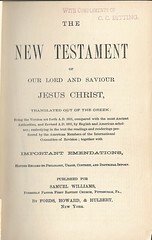 Title: The New Testament of our Lord and Saviour Jesus Christ, translated out of the Greek; Being the Version set forth A.D. 1611, compared with the most Ancient Authorities, and Revised A.D. 1881, by English and American scholars; embodying in the text the readings and renderings preferred by the American Members of the International Committee of Revision; together with Important Emendations, Having Regard to Philology, Usage, Context, and Doctrinal Import. 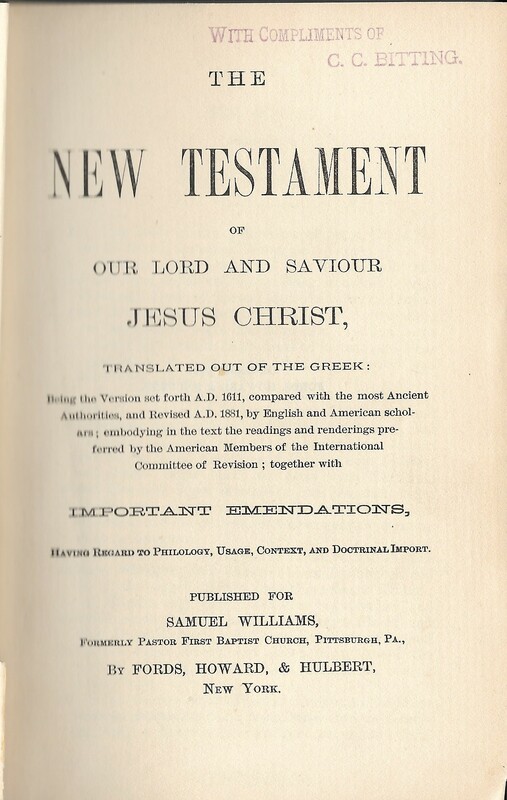 Published for Samuel Williams, Formerly Pastor First Baptist Church, Pittsburgh, Pa., By Fords, Howard, & Hulbert, New York.